(The Root) — My second time at the Congressional Black Caucus Foundation's Annual Legislative Conference was interesting, to say the least. Last year I attended as a newbie. My expectations were all based on what I had heard about the ALC, which is better known as CBC Week. I had jokingly referred to it as "political black freaknik" because of the overwhelming emphasis that many place on the parties and after-parties. However, after attending and working with the organization, my tone soon changed. This isn't to say that the ALC isn't full of parties. There are parties on top of parties inside of parties. But what's really interesting is the number of panels and discussions that occur when the partying stops. Discussions range from voter suppression to the state of black America as a whole. You see civil rights leaders walking through the exhibit hall, black and white politicians actively showing their faces — making sure people know that they were there and they weighed in on the topics that are close to black America's heart. This year I was fortunate to attend the closing event, the Phoenix Awards, where first lady Michelle Obama was lavished with applause and adulation as she delivered a hard-hitting speech with an emphasis on the importance of voting. I also got the opportunity to sit down briefly with a living civil rights icon, Rep. John Lewis (D-Ga.), who also trumpeted the need for voting with the passion of a much younger man. Everywhere I turned in this crucial election year, the urgency of voting was being hammered over and over again. And I'll be honest with you: When John Lewis, a man who was beaten on Bloody Sunday in 1965, tells you that voting is important, you hear those words in your soul. History doesn't often stare into your eyes, but when it does, you have no choice but to listen. This isn't to say that I don't have critiques of the ALC. I hope that as time goes on, they reach out to different segments of the black community that don't normally gravitate to such events. I would love to see more of a push to get their messages, which they are spending so much time on, out to more people through social media. There are various ways in which the overall event can improve and be more inclusive, but this doesn't negate the positives that come along with it. Having the opportunity to deal directly with many of the leaders within black America is something I don't think anyone who cares about our future should miss. On the opening night of the Annual Legislative Conference, the chairman of the Congressional Black Caucus, Rep. Emanuel Cleaver (D-Mo. ), with the managing editor of The Root, Sheryl Huggins Salomon. Rep. James E. Clyburn (D-S.C.) at the Phoenix Awards. Democratic Chairwoman Debbie Wasserman Schultz and Assistant Treasurer of the CBCF Kimberly Woodard share a laugh at the Phoenix Awards. Michael Eric Dyson and the Rev. Al Sharpton spoke only for a few minutes, but it was obviously about something very interesting at the Phoenix Awards. Civil rights icon John Lewis immediately after an interview with This Week in Blackness radio. Former Secretary of State Colin Powell cracks up at some commentary by a fan who just bought his book at the author pavilion at the ALC. The Chairman's Reception was made complete with a performance by the Stylistics. Two civil rights icons share a serious moment at the Phoenix Awards. 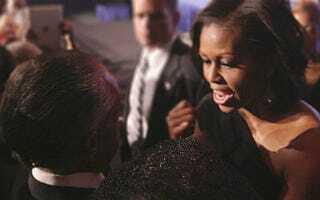 Sharpton and first lady Michelle Obama share a few words directly after her speech at the Phoenix Awards. Elon James White is a writer and satirist and host of the award-winning video and radio series This Week in Blackness. Listen Monday to Thursday at TWIB.FM and watch at TV.TWIB.ME. Subscribe on iTunes. Follow Elon on Twitter, Facebook, Google+ and Tumblr.